Why Won't You Grow?! : Walking around . . .
We've been a lot of places today. This morning, we caught one of the three remaining cable car lines that begins near our hotel and we rode up, up, up the hills past Union Square and to the downtown Financial District. 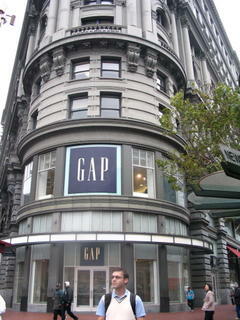 such as this nice building that (unfortunately) housed a Gap. 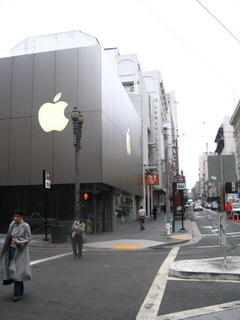 There was also the Apple building that I felt deserved a picture. Also along the way I saw many of the hated Dove ads. So, naturally, I wanted to get a picture of "Stacey." After that was finished, we walked through Chinatown. There we stopped to rest at a nice little park that was filled with locals reading the newspaper and playing cards, kids playing, etc. 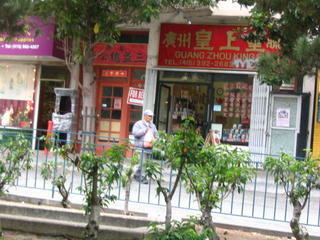 I took this picture of some shops behind the park that looks to have a little shrine out front of one of the storefronts. We continued to walk up through Chinatown and visited the Cable Car Museum. It was a nice place to rest and get some education of how these very historical transports work. Tegan took lots of notes on diameters of wheels, cable configurations, etc. I guess she will try to work these into her upcoming California books. I also bought my traditional refrigerator magnet in the shape of a cable car. We then walked back down through Chinatown to eat lunch at the House of Nanking restaurant. It was recommended by one of our guide books and the concierge at the hotel also said it was a good place to go. We walked in, told them we wanted scallops (me) and chicken (Tegan) and they came back with something. It was very nicely prepared and I enjoyed it a lot. some very nice views of the area. One nice man agreed to take our picture. 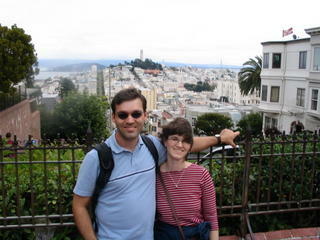 You can see Coit Tower in the distant background where we walked after lunch. This sort of gives you some idea of how high we are as compared to the rest of the land. 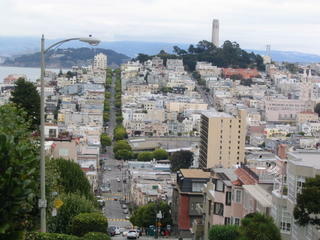 From there we walked back down Hyde Street, paralleling the cable car route we had taken that morning. Now we are back at the hotel and resting before we decide on what (cheaper) place to visit for dinner. I noticed an In-N-Out burger place a few blocks away, which is a place that some people said we should visit. Tomorrow morning we are going to try and work out a trip to visit Alcatraz Island. 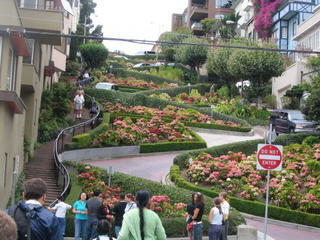 If that doesn't work out, then maybe we'll rent some bikes and tour areas west of Fisherman's Wharf. Looks like you guys are having a great time. Enjoy every bit of it. I can't decide which I like better: the picture of the Apple Store (which I hope you went into) or the picture of Burb in a sweater vest outside of a Gap.